It’s the Holiday Season. Whether it’s Black Friday, Cyber Monday, or the local flyer, you are constantly being enticed by low prices, many too good to be true. And sadly, many are. Either because the price doesn’t tell the whole story or because of limited quantities. Many online display websites are masters at enticing buyers with crazy low prices, which on further investigation are not quite as “cheap” as they seem. Then, there’s quality, warranty, and customer service questions to consider as well. There are two types of online display buyers. Some buyers prefer the “a la carte” approach, which allows them to add only the features they want. Makes sense. Others prefer the “what you see is what you get” experience. No surprises. No hidden charges. 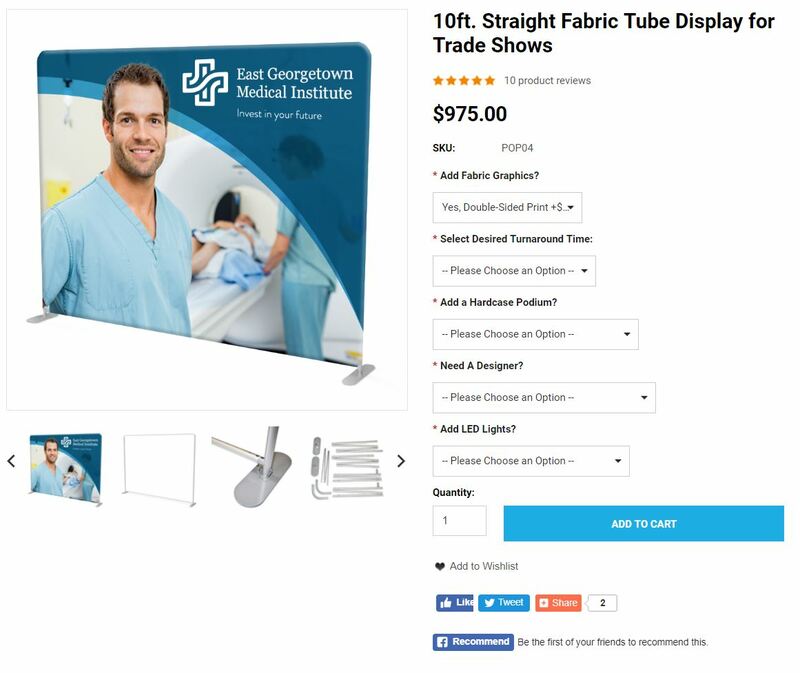 Here’s an example of the a la carte approach with a very attractive price on a 10 ft. portable display. Note the $275 price. After selecting the graphic, the next choice is the turnaround time. If you need it in less than 7 business days, there’s an upcharge. In this case, $200 for a three-day turnaround which bumps the price to $1,175. Although the soft case is included, you want your new display to last more than a few shows. Plus, it makes sense to incorporate a hard case into the booth presentation by adding a graphic. You’re now at $1495 which is considerably more than the original $275 price. The final two steps are graphic design assistance and adding lights. Graphic design requires a quote, which is reasonable and fair. The lights? Who wouldn’t want lights on a trade show display? Duh? The final price, excluding shipping and any graphic design charges, is $1595. Does this mean this isn’t a good value? Depends. 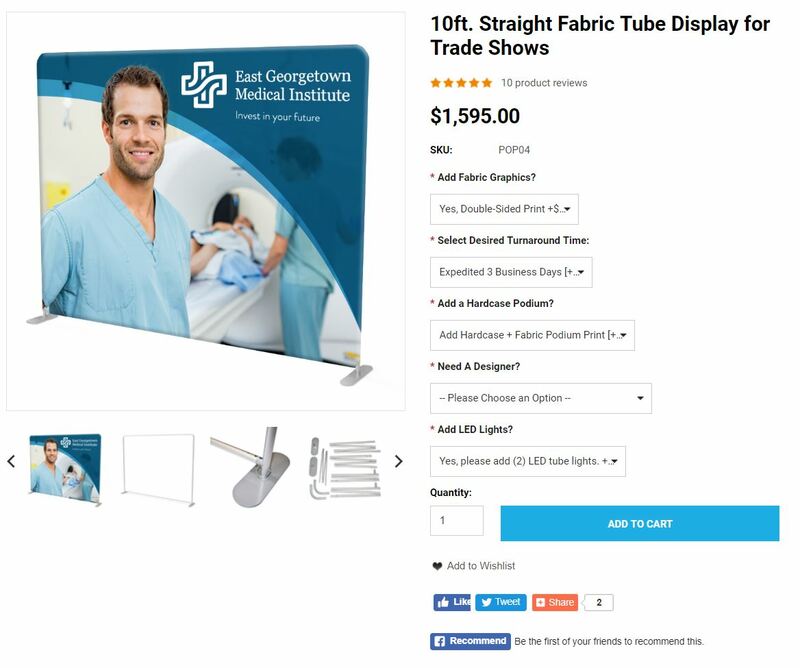 It’s a basic tube-assembly 10 ft. display ideal for many businesses, particularly for local events. The graphics may be fine but there’s no way of knowing if the company uses 2nd, 3rd, or 4th generation dye-sublimation printing. Many low-end supplies used direct to surface printing rather than dye-sublimation because it’s less expensive. And, once again, that may be OK if you are only planning to use the graphic for a limited number of shows. My point, however, isn’t to question the quality of the display. Instead, it’s to demonstrate that online display websites use two different approaches, namely “a la carte” vs. “as shown.” There are merits to both, but it’s important to understand the difference. At Classic Exhibits, we believe that “as shown” prices are an easier method for exhibit buyers to compare designs and features. It doesn’t require you to “Build the Price” to see the final price. And since all our displays can be modified/customized to the exhibitors preference, drop-down menus can’t possibly list all the available options. That would be a nightmare for the serious exhibit buyer. Have questions? Give us a call or send us an email. We would love to chat with you. Classic Exhibits Inc. designs and manufacturers portable, modular, hybrid, and custom exhibit solutions, including SuperNova LED Lightboxes. Classic Exhibits products are represented by an extensive distributor network in North America and in select International markets. For more information, contact us at 866-652-2100 or www.classicexhibits.com. 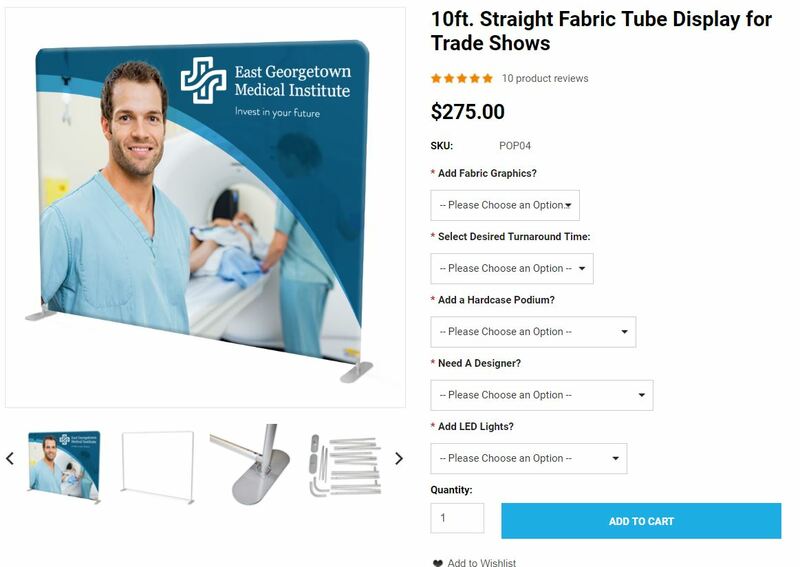 This entry was posted on Monday, December 3rd, 2018 at 10:12 am and is filed under Business Tips, Classic Exhibit Systems, Mel White, Trade Show Marketing. You can follow any responses to this entry through the RSS 2.0 feed. You can leave a response, or trackback from your own site. Don't miss another blog post! Trade Show Tales covers trade show marketing, design trends, promotions, and all things Classic Exhibits. If it's important . . . it's in our blog. Selby's on Never Eat or Drink in Your Trade Show Booth. Seriously? Dude, It’s 2018! Mel White on Before the Show Opens. After the Show Closes.